The geopolitical reality today could not be more different. Over the past two years alone, Russia has annexed the Crimean peninsula, waged a proxy war in eastern Ukraine, and consistently spewed grossly distorted anti-Western propaganda on a daily basis. Its current military actions in Syria are a clear continuation of this newly aggressive behavior. Today, it is hard not to notice the prescience of Lucas’s warnings. A longtime foreign correspondent and senior editor of The Economist, Lucas is a journalist at heart, and the 2014 edition of The New Cold War—updated to reflect Russia’s intensified threat to international security—is most engrossing when it plays to his strengths as a storyteller. At times, the book reads more like a Cold War thriller than a sober analysis of geopolitics, but Lucas’s style serves his audience well, without compromising on substance. Freed of the dry, dense prose that is typical of so much academic writing, The New Cold War is accessible to both laymen and experts alike. And discipline Russia got—but in all the wrong ways. While Russia has reclaimed stability from the chaotic rule of the mafia and the oligarchs, the state now functions as an autocratic kleptocracy—a political system that exploits a country’s resources for the exclusive benefit of the ruling class. In support of this contention, Lucas cites a number of people who, having run afoul of Putin’s favor, have had their assets seized by the state: Mikhail Khodorkovsky, Boris Gusinsky, and Boris Berezovsky top the list. Meanwhile, Lucas explains, Putin rewards his friends with major government and corporate positions, sometimes in areas wholly unrelated to their careers in security and intelligence; he points to ex-KGB officials Sergei Ivanov, Igor Sechin, and Sergei Naryshkin as significant beneficiaries of this Kremlin-sponsored cronyism. Furthermore, Lucas notes that Russia’s media and political landscapes are structured to benefit allies of the regime. The Kremlin controls the judiciary and legislative branches of government, saturates the media with propaganda, and overwhelms political opposition through electoral chicanery and brute force. The ultimate result is a system that rewards loyalty and stifles independence—all to the benefit of the powers that be. Lucas describes Russia as an autocratic kleptocracy rotting from within, but the main focus of The New Cold War is the havoc that Russia has been wreaking on the world stage. One of the biggest challenges Lucas envisions for the West is mitigating Russia’s control over the European energy market, a perennial victim of the Kremlin’s whims. In one particularly egregious case that Lucas highlights, Russia doubled the price of gas exports to Ukraine, likely as punishment for its pro-democratic Orange Revolution in 2005. From Lucas’s perspective, the only effective answer to Moscow’s energy monopoly is to cut the West’s dependence on Russian gas. This, of course, is easier said than done; there are certainly a number of influential Western-based companies whose financial fortunes depend on cash flow from regional oil fields (Shell and British Petroleum are particularly conspicuous examples). But if defending the West from Russian pipeline warfare comes at the expense of corporate profit, Lucas argues, then so be it. In addition to monopolizing gas distribution within Europe, Russia has also been guilty of aggression and “military adventurism” abroad. Lucas cites Russia’s meddling in Moldovan Transnistria, as well as its invasion of Georgia’s Abkhazia and South Ossetia, as prime examples of the Kremlin’s expertise in fomenting and maintaining “frozen” conflicts when it finds them convenient. He argues that Russia’s involvement in these conflicts is a product of “sovereign democracy,” a Kremlin-designed ideology that aims to counterbalance Western influence within the former Soviet empire. Within this worldview, the Kremlin supports its neighbors’ sovereignty as long as this independence coincides with its own interests; when it does not, Moscow readies its guns, emphasizing the importance of protecting ethnic Russians abroad and citing Western hypocrisy when criticized. Ultimately, though, Lucas’s main point here is that Russia’s boorish behavior is a symptom of weakness: as long as the country suffers from poor governance domestically, its leaders will fear effective, democratic governance abroad. By now, disheartening appraisals of contemporary Russia have become somewhat cliché within Western circles, and The New Cold War certainly conforms to this standard (albeit accurate) storyline. But what makes Lucas’s book compelling is the sheer starkness of its warnings about and solutions to this newly aggressive Russia. 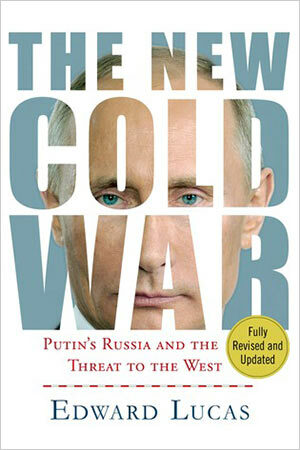 If the West doesn’t act soon and decisively, Lucas argues, the New Cold War is already lost. His approach precludes wishful thinking that Russia will soon return to civilized diplomacy and democratic governance. In that vein, he argues for independence from Russian gas, excluding Russia from Western international organizations such as the Council of Europe and the G-8, strengthening the Atlantic alliance between America and the EU, reinforcing NATO’s presence in the Baltics, and leveraging sanctions against Russian elites. Notably, though, Lucas never expresses much optimism about some of the very steps he pushes forward. He admits that some of these actions—visa sanctions, asset freezes, the suspension of Russia from Western organizations—tend to “reinforce the regime’s message to the Russian people: that their country is surrounded by malevolent hypocrites,” ultimately validating the very behavior that prompted these punishments in the first place. Indeed, over the past two years, the West has suspended Russia from the G-8 and has targeted the Russian economy and a number of Russian elites with sanctions—all with little positive effect on Russia’s behavior. Lucas seems to place more confidence in bolstering NATO and weaning the West off of Russian gas, but even in discussing these longer-term solutions, he is quick to emphasize that if action is not taken soon, it might all be for naught. Lucas never explicitly reconciles his support for such solutions with his belief that they have a high potential for failure. Maybe this is because he is choosing among a set of truly dismal options. But more likely it is because, in Lucas’s view, the conflict between Russia and the West is an overtly moral one between the forces of freedom and tyranny. The West must act if it is to preserve its integrity as an actor for “good.” Lucas believes in the West because he believes in the power of freedom and democracy. The West, he writes, has the means to outmuscle Russia. But does it have the will?